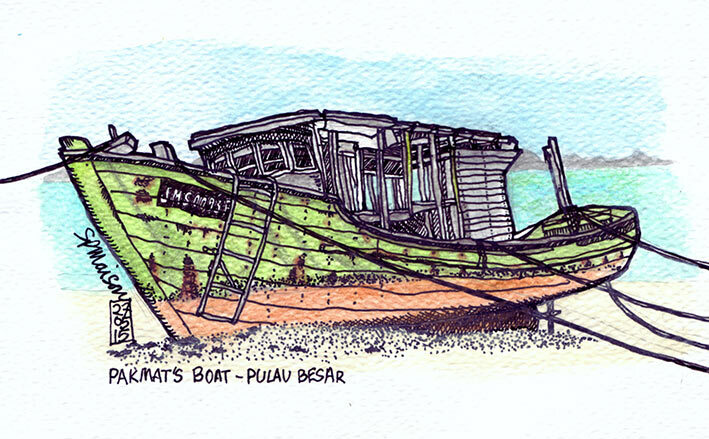 In the early morning, I sat on the beach doodling the new bar which is one of a number of improvements at Aseania. Without shade, the time was limited to less than an hour, so I would have to return at the same time tomorrow. While drawing, one of the staff was raking the beach leaving a satisfying random pattern of closely-spaced lines. I want to do this in my retirement. It is so peaceful. The problem is I would not allow anyone to walk on the beach afterwards. After breakfast with Mrs M and our new friend, a sweet ginger puss, I wandered along the beach to find something else to draw. I found what I thought was a shipwreck, except that it was tied to trees and rocks with numerous ropes. 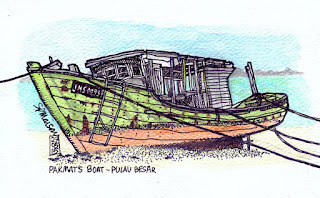 In mid-doodle, I heard rummaging from a pile of blackened debris on the beach which was being sorted by the owner, Mohammed, who was attempting to repair the boat after an engine fire. My sketch perhaps, did not adequately convey the magnitude of his task. Meanwhile, Mrs M contentedly snorked and relaxed in the shadow of palm shades on the beach. We met for meals throughout the day to relive some of our fondest memories.